Here are a few of our favourite recipes and cooking suggestions to make the most of your bird. 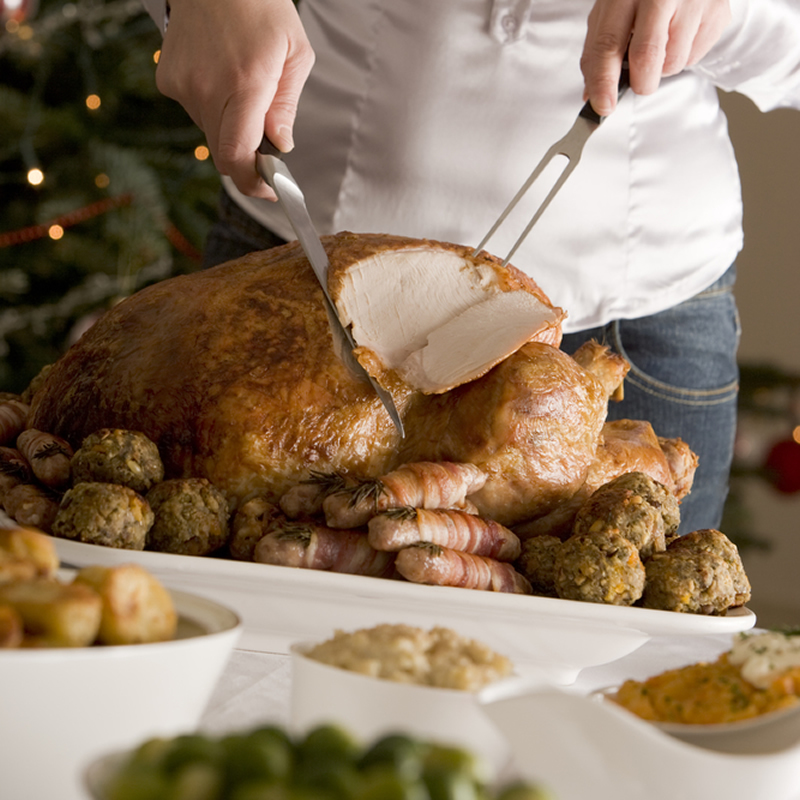 There is so much mythology around cooking a turkey, some people advise wrapping and stuffing the bird with all sorts of weird and wonderful ingredients or soaking it overnight, others get up at an unearthly hour on Christmas Day to get the bird cooked on time. None of this is necessary. Because our birds are grown slowly and are allowed to mature, they are self-basting, cook quickly and will not require much attention once in the oven. So here is how we will be cooking our turkey on Christmas Day. Cooking: We preheat the oven to 200c, place the turkey in a large roasting tin and place in the oven without any added extras. Roast for the first 30 minutes in a hot oven, then reduce the temperature of the oven to 160c. The length of cooking time will then depend on the turkey’s size. Allow 15 minutes per pound total cooking time (including the first 30 minutes) for a smaller bird, or 12 minutes per pound for a larger bird. You can place some rashers of streaky bacon over the breast near the end of cooking if you like. Is it done? The turkey is cooked when the juices run clear if you pierce it with a skewer or fork in the thickest part of the thigh. If you are unsure you can use a meat thermometer. If turkey is getting well browned on the skin or legs before it has finished cooking through, cover with foil to prevent further browning towards the end of cooking. To stuff or not to stuff? We put stuffing in the neck end only of our bird and leave the body cavity clear, this means that hot air can get into the body cavity and help to cook the bird from the inside. If you do choose to stuff the body cavity then remember this will increase the cooking time. You can roast a Guinea Fowl in the same way as a chicken. I normally cook a 2kg Guinea Fowl for about 1 hr 20 mins at about 180c. Mix together 4oz breadcrumbs, 2oz suet, the rind of one lemon and 2 tablespoons of parsley. Season the mixture with salt and pepper and bind together with a beaten egg. This recipe is a big hit when we serve it piping hot at food festivals. Soak mushrooms in 200ml boiling water for 20 minutes. Preheat the oven to 200°C/fan180°C/gas 6. Heat the oil in a small casserole. Season the guinea fowl joints, add to the casserole and brown all over. Lift out, then add the bacon and fry until golden. Add the onion and fry over a medium heat for 5 minutes until soft. Drain the mushrooms, reserving the liquid, and add to the pan with the garlic and fry for 2-3 minutes. Add the wine and mushroom liquid and simmer vigorously until well reduced. Return the guinea fowl to the casserole, pour over the stock and cover with a tight-fitting lid. Cook in the oven for 1hr 30minutes. If you wish to thicken the gravy, lift the guinea fowl joints onto a board. Cover tightly with foil and let it rest for 10 minutes. Meanwhile vigorously simmer until reduced to a well-flavoured sauce. Stir in the parsley. Serve meat with sauce spooned over. Preheat oven to 170 C / Gas 3. Add oil and butter to a large casserole, and melt over medium high heat. Add the guinea fowl and brown over high heat. Do this in batches so that you don’t overcrowd the pan. Place all of the guinea fowl in the casserole and sprinkle with the herbs, season with salt and pepper. Add the carrots, onions, whole mushrooms and garlic around the guinea fowl and pour the wine over. Cover and bake in the oven for 90 -120 minutes. Check the guinea fowl from time to time and remove the lid 15 minutes before the end of the cooking time.